This NASA file photo shows the first stage of the mighty Saturn V rocket used to launch the historic Apollo 11 moon landing mission in 1969 as the booster was being built. The five huge F-1 rocket engines were discarded into the Atlantic Ocean after the July 16, 1969 launch. 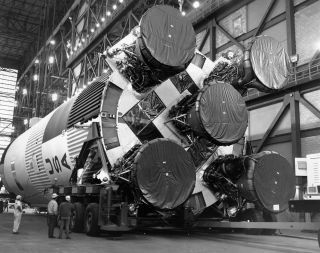 When NASA's mighty Saturn V rocket launched the historic Apollo 11 mission to land the first men on the moon in 1969, the five powerful engines that powered the booster's first stage dropped into the Atlantic Ocean and were lost forever. Lost, that is, until now. A private expedition financed by Amazon.com founder and billionaire Jeff Bezos has discovered the five F-1 rocket engines used to launch Apollo 11 into space on July 16, 1969 and is drawing up plans to retrieve one or more so they can be publicly displayed. "I'm excited to report that, using state-of-the-art deep sea sonar, the team has found the Apollo 11 engines lying 14,000 feet below the surface, and we're making plans to attempt to raise one or more of them from the ocean floor," Bezos wrote in a statement posted to the Bezos Expeditions website. "We don't know yet what condition these engines might be in - they hit the ocean at high velocity and have been in salt water for more than 40 years. On the other hand, they're made of tough stuff, so we'll see." The Apollo 11 Saturn V space vehicle climbs toward orbit on July 16, 1969, bearing astronauts Neil A. Armstrong, Michael Collins and Edwin E. Aldrin, Jr. Armstrong and Aldrin would make history as the first men on the moon. Bezos said he was only 5 years old when he watched with rapt attention when Apollo 11 astronauts Neil Armstrong, Buzz Aldrin and Michael Collins made their historic voyage to the moon. But it was only recently that a question struck his mind. "A year or so ago, I started to wonder, with the right team of undersea pros, could we find and potentially recover the F-1 engines that started mankind's mission to the moon?" Bezos wrote. It was then that Bezos began planning what his website billed as the F-1 Engine Recovery expedition. If one of the Apollo 11 F-1 engines is ultimately recovered, it will be turned over to NASA, Bezos added. "Though they've been on the ocean floor for a long time, the engines remain the property of NASA. If we are able to recover one of these F-1 engines that started mankind on its first journey to another heavenly body, I imagine that NASA would decide to make it available to the Smithsonian for all to see.," Bezos wrote. "If we're able to raise more than one engine, I've asked NASA if they would consider making it available to the excellent Museum of Flight here in Seattle." Bezos stressed that at no point will public funds be used in the F-1 engine recovery project. The entire effort is a privately-funded expedition, he wrote. "NASA is one of the few institutions I know that can inspire five-year-olds. It sure inspired me, and with this endeavor, maybe we can inspire a few more youth to invent and explore," Bezos added. The Apollo 11 project is not Bezos' only space-themed project. His private spaceflight company Blue Origin is developing a commercial spaceship capable of flying people to and from Earth orbit. That project has received some NASA funding to push its space capsule plan forward. Only three Saturn V rockets remain today, and only one is assembled from entirely from flight-capable hardware. The 363-foot (110.6-meter) tall boosters on display at NASA’s Kennedy Space Center in Fla. and the U.S. Space & Rocket Center in Huntsville, Ala. are comprised of flight, test and replica components. The Saturn V at Johnson Space Center in Houston, Texas is built entirely from leftover flight hardware. Additional standalone F-1 engines, which never flew, are displayed across the nation, including in Washington, D.C. at the Smithsonian's National Air and Space Museum. In total, NASA launched 65 F-1 engines, five per flight, on 13 Saturn V boosters between 1967 and 1973. Follow SPACE.com for the latest in space science and exploration news on Twitter @Spacedotcom and on Facebook.Follow collectSPACE on Facebook and Twitter @collectSPACE.